Globally, wheat trade is the larger in trading volume compared to the other types of crops. 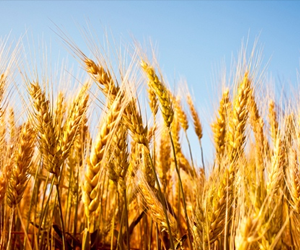 In 2013, the world production of wheat reached 713 million tons. With that output, wheat comes in third place right after Corn and Rice regarding global production after being in second place in 2009. Wheat also comes in second place as to nutrition supplements. Wheat contains a higher portion of plant proteins than other major grains such as maize or rice, and because of that, it is the main source of such proteins in human food. Wheat is cultivated on more than 540 million acres around the world, which is also more than any other grain, as it is everybody's number one choice besides rice. Wheat average per capita consumption hit 65 kg worldwide. North African and Middle Eastern countries are the main consumers as there are no dining tables without wheat bread or another sort of foods where wheat is the main component, unlike the Asian people who prefer rice over wheat. Recently an increase has been noted in the wheat popularity in Asia. Chinese international wheat trade reached 1/6 the world trade volume. Lately, the slow in population growth rate led to holding the expansion of wheat production due to the low grain demand. The rise of the U.S. dollar value caused a decline in the popularity of American wheat in the international market due to its high price compared to Ukrainian, Russian or French wheat which cost 10% less than the American Wheat. The high cost of American wheat led to a rise in wheat stocks compared to domestic use in the US. It is expected that 2016 season will witness the second highest used stocks in the history of the United States. Unlike oil, which is monopolized by Saudi Arabia or Cocoa which is monopolized by the Ivory Coast and palladium by Russia, the production of wheat can not be monopolized by any country. China is the world’s largest producer of wheat. Yearly production volume reached over 115 million tons of grain in China followed by India with a production volume of 81 million tons, Russia comes in third with 61 million tons, however, it is expected to increase at this season up to 100 million tons, reaching the second place after China. Other producers such as Canada, France, and Ukraine have an annual output far less than the above mentioned. Overall, Egypt is the largest wheat importer in the world and it resorts to importing wheat in order to make up the lack of domestic production. In 2016, the Egyptian Government rejected three shipments of Russian and Ukrainian wheat because it contains 0.5% Ergot which is allowed universally. Due to the intransigence of the Egyptian government that demanded ergot free wheat forced producers to refuse to participate in government tenders, leading to lower prices of wheat in the international market. Later that year the Egyptian government relented and imported from Russia. Wheat is traded in world markets through futures, Forex, and online trading. Moreover, the Wheat online trading brokers mentioned will help you to learn not only how to trade Wheat online trading and also other commodities and different kinds of assets. All the brokers` reviews you can find here are tested, verified and approved by our experts. That is why you can be sure that after having chosen any of Wheat online trading brokers from our list you will get an excellent experience. Moreover, you can easily find online trading videos together with other various education materials almost in every broker. We hope that Wheat online trading will become a new interesting and captivating activity that will bring you high payouts.